Looking for an ugly Christmas sweater to grace that holiday party? One guaranteed to turn heads, spark smiles, and have everyone wanting to take a pic with your crazily-clad self? We’ve got you covered! Combining festive prints and fun colors, our ugly Xmas sweaters are the perfect accessory to make this holiday season extra-special. 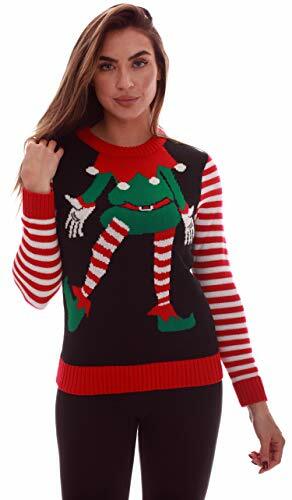 Choose between quirky Santa, elf, Rudolph, fair isle and candy cane prints to wear around Christmas, or go for the cool skeleton print that’s perfect for Halloween or any ugly sweater party. No one’s been left out of the gawking goodness! Our ugly sweaters come in men’s, boys’ and girls’ versions. Want matching outfits to make that holiday card, Christmas special newsletter, or Instagram family pic truly memorable? Grab sweaters for the entire fam and make it happen. Want to match with your significant other and look all tacky-chic? You have the freedom to do just that. After all, intentional tackiness is best when shared! - Comes in S-XXL to fit any frame or build. - Made using comfortable 100% acrylic. - Retains its shape and color when washed. - Made with great attention to detail for a clean look. - Backed by a 100% satisfaction guarantee. Click ‘Add to Cart’ now for an ugly Xmas sweater you’ll love to rock!